Protein Jaffa cakes! Welcome to one of my favorite protein recipes of all time. If you don’t know what Jaffa cakes are, they’re a British ‘biscuit’ made up of an almondy sweet sponge base, an orange jam layer, and chocolate. They’re phenomenal! However, they’re really high in sugar and offer little else by way of nutritious ingredients. This recipe is a healthy twist on them! Higher in protein, lower in sugar, yet just as finger-lickingly delicious. But that’s not the best part about this recipe. The best part is that these healthy jaffa cakes are REALLY easy to make! Seriously, they require extremely little skill or attention to detail. Even someone with ‘two left hands’ could do this and I urge you – strongly urge you – to give them a go. Seriously, they require extremely little skill or attention to detail. Even someone with ‘two left hands’ could do this and I urge you – strongly urge you – to give them a go. I promise you won’t regret it and am willing to almost guarantee that you’ll be hooked on these…. forever! There’re no turning back here. *Note: this recipe is in grams, if you’d like it converted to cups/tbsps, use our Protein Pow measurement conversion chart. 1. First, make your cake bases by blending all the base ingredients above together an bake the ensuing batter at 170 C (228 F) on a cookie tray for about 15-20 minutes or until they’ve cooked through. You’ll want to make five round ‘blobs’. Once cooked, remove them from the oven and allow them to cool. 2. Add a tbsp of sugar-free orange marmalade on top of each cake and melt 5 squares (i.e, 50 grams) of dark chocolate in a bain marie – a glass bowl on top of a pot of boiling water. When the chocolate has melted, pour it onto each of the little cakes. Allow for the cakes to cool and the chocolate to set and you’re ready! Ready to experience Jaffa cake protein heaven! Macros per Jaffa cake (out of the five you get from the mix above): 120.2kcals, 10.2 (out of which 1.5g is fiber) of carbs, 7.6g of protein, and 5g fat. 1. Instead of orange marmalade, consider using a dollop of peanut butter instead or even some sliced banana! 2. If you don’t have pea protein powder you COULD use casein but, if you do, add also a tbsp or two of almond flour to the mix to ensure your cakes don’t dry up. 3. I like using 85 to 100% dark chocolate but anything over 70% should work great in this recipe! 4. 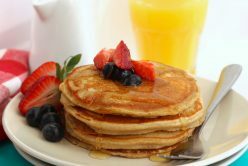 If you want to substitute the agave syrup, you can use honey or maple syrup.